What I know is that in a suicide crisis, the difference between recognizing and acting where there are vague ideas of suicide before these lead to a self-inflicted injury, can mean the difference between life and death. The sooner warning signs are detected and help sought, the better the outcome of a suicide crisis will be. No one person, organization or group is responsible to help with this issue of suicide prevention. We ALL need to be aware of these signs and reach out. But ask yourself: Do you have the capacity to actually ask the question without judgement? If you can’t, find someone who can. Find out about the resources available. Keep helpline numbers handy. That is just as valuable. Maybe you can become the person’s at risk support after the crisis. Just this year, I have stood in a classroom surrounded by youth and when I ask that question. When asked, over 80% of students say yes they have been impacted. Further, when I have asked if they have talked, texted, used social media with someone about suicide, 100% of them say yes. According to the 2015 Tillamook County Oregon Health Teen Survey, 11% of 8th grade and 21% of 11th grade students reported they have contemplated suicide. Unfortunately, there is a perception that youth will automatically contact an adult if they are or know someone who is in a crisis. What stops them? Oftentimes, kids get stuck in their fear of not knowing what to do and getting their friend in trouble. By empowering youth with the knowledge where to go, who to talk to and what to say they will more likely reach out to their peers. However, the adults in their lives also need to know the same. What is a suicide safe community? A suicide safe community is one that has demonstrated a commitment to suicide prevention, promoting wellness and mental health, an ability to talk openly and freely about suicide and support to those whom have been impacted. It is a community that know that by saving one life at a time, it contributes too few suicides in the community as a whole. Why build a suicide safe community? Suicide is a community health problem. The stigma surrounding suicide reduces the range and number of people who could help and prevent suicide. Suicide is not the domain of any one discipline or viewpoint and virtually everyone will think about suicide at some time in their life. Thoughts of suicide are dangerous and all persons with thoughts of suicide should be taken seriously. Regarding one person’s thoughts of suicide as more serious than another’s is almost as dangerous as suicide itself. 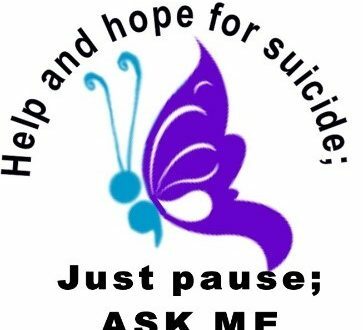 We start by educating yourself about suicide. What it is and what it isn’t. Further, we start talking to people opening about it and finding out if they have been impacted. 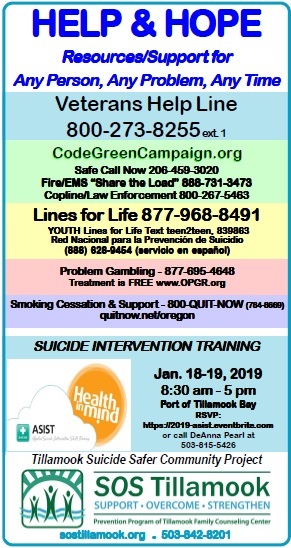 In partnership with Columbia Pacific Coordinated Care, free movie showings of “The Ripple Effect”, QPR Suicide Intervention Trainings and ASIST classes are being offered to provide training on basic suicide awareness. ASIST Training coming – Mark your calendar – January 18 and 19, 2019, a two day training will be offered at TBCC: Applied Suicide Intervention Skills Training (ASIST) is for everyone 16 or older-regardless of prior experience-who wants to be able to provide suicide first aid. Shown by major studies to significantly reduce suicidality, the ASIST model teaches effective intervention skill while helping to build suicide prevention networks in the community. You can RSVP with DeAnna Pearl @ 503 842 8102 x 270 or email DeAnnaP@tfcc.org.